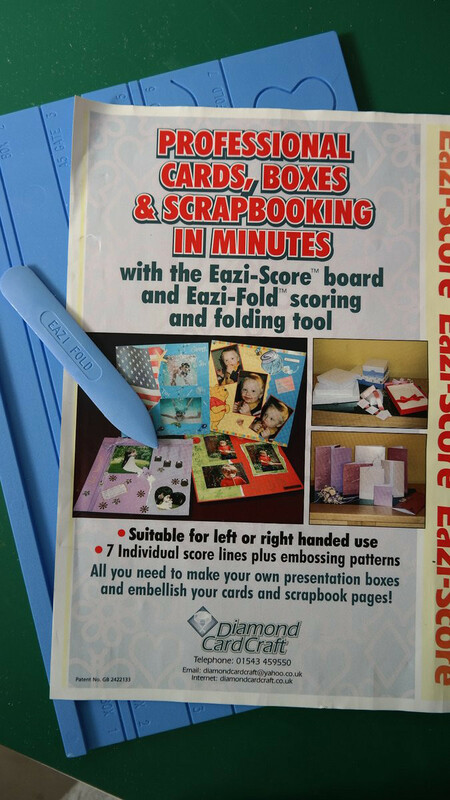 What is a scoring board I hear you asking, well it isn't to keep a check on how many cards you make....but an essential piece of equipment to produce professional cards. I use a scoring board on a daily basis and I couldn't imagine working without it. There are many different types on the market to suit all budgets the choice is yours. If you prefer to fold your own, rather than buy base card, then you will need one. They have grooves at marked intervals, for several commonly used card sizes, such as 5", 6", DL and A5. And using a "bone folder" in the grooves produces a really good deep score line, ready for you to fold. 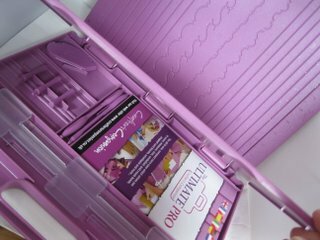 This is the Ultimate Pro and on the outside you can see the lines that will enable you to make envelopes of many different sizes. 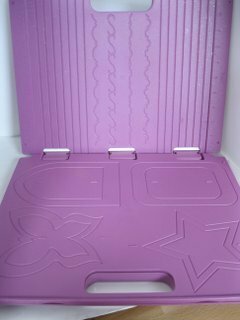 There are also shapes to add extra patterns to your card and produce an extra dimension. 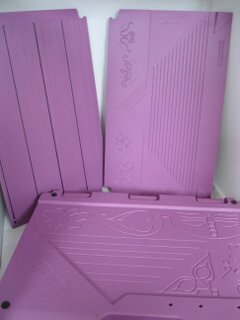 All sizes and depth of card are catered for and it has the facility to dry emboss more small shapes on the inside of the board. You can buy the boards in most craft shops or direct from Online Stores. Ask in the craft shop for a demonstration of the board you choose before you make your decision. But it will give you a professional finish to your cards and if you make them to sell then it is worth the cost. It can save you hours of work too. Why not batch fold all your cards one evening. Do them all at one go while you watch TV or listen to music,and then you will always have some ready to use. And everything is stored safely within the board itself. 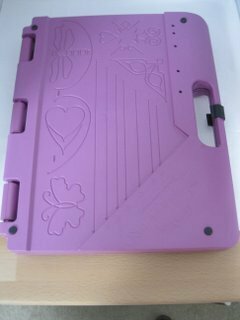 There is a cutting ruler and blade for accurate measuring, and pegs that can be fitted into the holes on the outside of the board to help you make the neatest of bows. It has a really good instruction booklet with it, to explain fully all it can help you achieve. And it is excellent value for money. An added bonus are the extra boards that will fit inside the case for accurate scoring of card, paper and other materials that you may need for your designs. The board pictured on the left is double sided .... inches on one side and centimetres on the other ... so an excellent choice people who can't convert from one to the other. This does it all for you making it an excellent choice whichever you prefer to work with ... and where ever in the world you are. This board will fit into your crafting bag to take with you and is suitable for right or left handed people.